The Senate Finance committee late early Thursday (August 2) added a one-year extension of the $12-billion wind energy production tax credit (PTC) into a broad, $205-billion tax credit extension bill, reviving hopes that a sharp contraction in US demand for wind power may be avoided, according to a Reuters report. US wind energy industry participants, such as Denmark's Vestas, are cautiously encouraged by the PTC's revival, but some of the nation's largest utilities, including Chicago-based Exelon, are working to assure the tax credit extension doesn't make it through Congress. Faced with the year-end expiration of the PTC, US wind energy projects are being postponed and canceled. 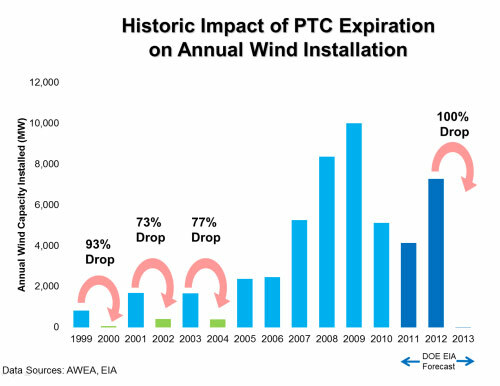 Repeated enactment and lapse of the wind energy PTC since it was first passed in 1992 has prompted a series of booms and busts in US wind energy, industry participants and proponents note. The wind energy PTC allows wind power producers to take a 2.2 cents-a-kilowatt hour credit against their tax bill. When it's been allowed to expire, US wind power installations and wind turbine orders collapsed, the former falling between 73%-93% and the latter 75% in a single year, according to a American Wind Energy Association (AWEA) study. The CEO of market-leading wind turbine manufacturer Vestas has repeatedly warned that a repeat is in store should the current PTC be allowed to expire. A detailed Navigant study of the history of the US wind energy PTC for the Union of Concerned Scientists shows that the federal government's "stop-and-go" policy of enacting the wind energy PTC and then allowing it to expire has wreaked havoc on the industry, the broader economy, and job creation. With the federal wind energy tax credit in place for six years now, US domestic production of wind turbine components has grown 12-fold at what's now more than 400 facilities in 43 states. That's brought highly valued manufacturing jobs back to the US, the AWEA points out. Enacting a four-year extension of the PTC would keep the US wind energy industry on track to supporting half-a-million jobs by 2030, a statistic projected in a US Dept. of Energy report completed during the G.W. Bush administration, the AWEA has noted. Should the wind energy PTC be allowed to expire at year-end, 50% of US wind energy industry jobs -- some 37,000 -- would be lost, including a roughly 1/3 cut in US wind energy manufacturing jobs, according to Navigant's analysis and projection. The outlook for extension of the federal wind energy PTC is highly uncertain, as wind and renewable energy tax credits and other government incentives sought by the Obama Administration and supporters in Congress have been consistently stymied by opponents. Federal government support for renewable energy has become a "hot button" political issue and dividing line for President Obama and leading Republican candidate Mitt Romney. Though it's one of the largest providers of wind power in the US, Chicago-based Exelon is also the largest provider of nuclear power. Sharp declines and fast-growing production of clean, renewable wind power is cutting into its profits, as electricity produced from nuclear energy comes with higher profit margins, the Chicago Tribune reports. "Wind power provides a fraction of power in the U.S., but once the turbines are running, they depress electric prices because wind as a fuel is free. At certain times, such as the middle of the night, wind power can help drive electricity prices to below zero," the Chicago Tribune's Julie Wernau explains in her article. She notes that Exelon's "been a climate change evangelist for 20 years, billing itself as one of the greenest, lowest-pollution-emitting power producers in the country." Nonetheless, nearly half the company's profits come from its nuclear power plants, and low-cost wind power, as well as low natural gas prices, which are cutting into its profit margins. Rising to CEO through Exelon's nuclear power division, CEO Christopher Crane says that after 20 years, it's time to let the federal wind energy PTC expire. "The (production tax credit) has been in place since 1992, I believe," Crane was quoted as saying during an earnings conference call with investors and analysts Wednesday." And I think that's enough time to jump-start an industry, 20 years. So, we've made it known, even as a wind company, that it should be stopped." It didn't take long for criticism of the Exelon's CEO statements and Exelon's lobbying to squash the wind energy PTC to emerge. "Exelon has been advertising for years how green the company is. They've been showcasing wind turbines on their materials. They've been proud of their sustainability footprint," the Chicago Tribune quoted Howard Learner, executive director of the Chicago-based Environmental Law and Policy Center. "Exelon coming out to oppose reasonable incentives that are working to spur wind power development is just tone-deaf." To set the facts straight, the wind energy PTC has not been in place for 20 years. It's been allowed to expire three times since 1992, prompting dramatic drops in wind power installations, demand for equipment and job creation. See the the AWEA's "Save USA Wind Jobs" website for more.